Is your dog the runt of the litter? A scrawny pup? Does he or she run and hide behind your legs whenever a bigger dog walks by? Then it’s time for your dog to do some bulking up! Just as it’s possible for skinny humans to pack on pounds and add lead muscle to their bony frames, even a rail-thin dog can evolve into an impressive physical specimen with a little work. Just imagine: Lean, rippling muscle. A strong, shiny coat. Your dog—bristling with energy and vitality. It’s enough to make strangers stop and congratulate you on raising such a beautiful beast. These 7 tips come from straight from champion breeders and dog trainers. It doesn’t matter if your goal for your dog is to compete in weight-pulling, take first place at dog shows, or just intimidate would-be burglars. Follow these 7 tips and your skinny dog will be a muscle-bound beast before you know it. Everything Starts With A Good Diet. Your dog’s diet is the foundation of his physique. So if your dog is a runt, the most likely culprit is inferior dog food. Many dog foods make wild health claims on the package…only to fill their food with cheap ingredients like corn and meat byproducts. Don’t believe the hype on the front of the bag! Always take time to examine the nutrition label and find out what’s really in that dog food. Look for whole meats and lots of protein. Remember that the ingredients are listed in order from highest amount to lowest amount, so the ingredients that are listed first are present in the highest percentages. 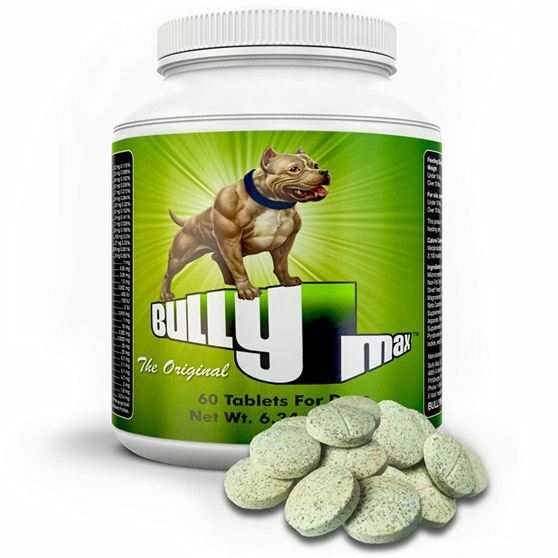 Supplement With Bully Max To Fill In Nutritional Gaps. So you’ve beefed up your dog’s diet, and now he’s eating much more nutritional food. That means he’s getting all the vitamins and nutrients he needs to grow, right? Unfortunately, even the best dog foods are incomplete at best. Some foods are better than others, but there simply aren’t any that provide 100% of all the nutrients your dog needs to achieve optimal health. That’s where Bully Max comes in. 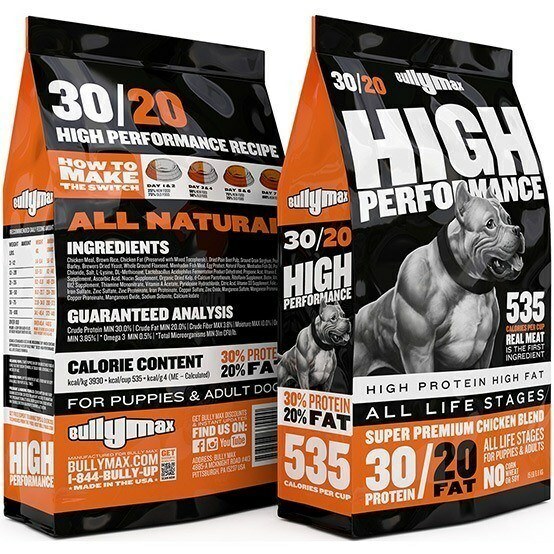 Bully Max is formulated by veterinarians to fill in all the nutritional gaps in your dog’s diet. It adds extra protein to fuel lean muscle, along with dozens of trace vitamins and minerals to support healthy joints, a shiny coat, a strong immune system, and improved energy & vitality. 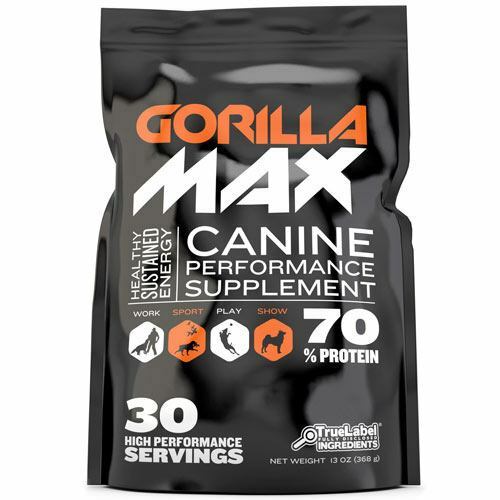 Combined with a healthy diet, Bully Max is the best way there is to give your dog a full dose of all the vitamins & nutrients needed to pack on pounds of lean muscle fast. When bulking up your dog, it’s important to make sure he gets at least 30 minutes of brisk walking per day–and preferably more. Remember, if you increase your dog’s diet without adding exercise to the mix, your dog is more likely to gain fat than muscle. Talk to your vet before adding more advanced exercises, especially if your dog is under one year old. It’s important to let puppies fully develop before adding the strain of weighted exercises. Add Weight Vests For An Extra Challenge. The next level of exercise is to incorporate a weight vest during walks. This adds the extra resistance your dog needs to really ramp up its muscle-building into high gear. Make sure to start light and work your way up to heavier weight vests. You should begin with 5% of your dog’s body weight, and over time work your way up 20% of your dog’s bodyweight—never more than that. Remember, some resistance will stimulate muscle-building in your dog, but too much resistance can lead to overtraining and even cause injuries. Graduate To More Advanced Exercises. Give Time For Muscles To Recover & Develop. Always remember: exercise breaks muscles down. It’s during the recovery phase that your dog’s muscles actually repair, recover, and grow stronger. So be patient and safe. Increase your dog’s exercise gradually, and always make sure he’s getting the nutrition and rest he needs to grow, grow, grow! As a dog owner, few accomplishments are more satisfying than transforming your best friend’s physique for the better. With a little time, love, and of course Bully Max, you can take your animal from a little runt to a strong, happy, confident dog in just a few short months. 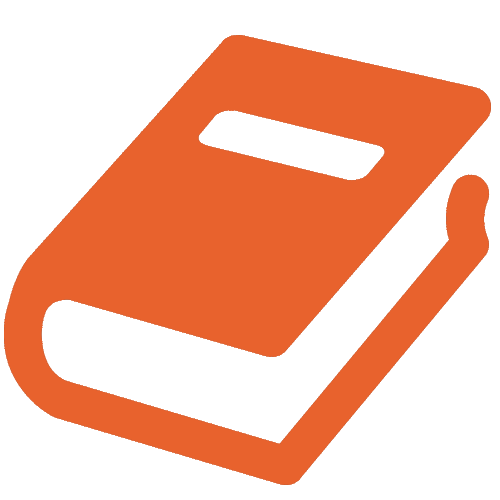 Ready to begin? There’s no better way to get started than to sign up now for the Bully Max 30-Day Challenge!